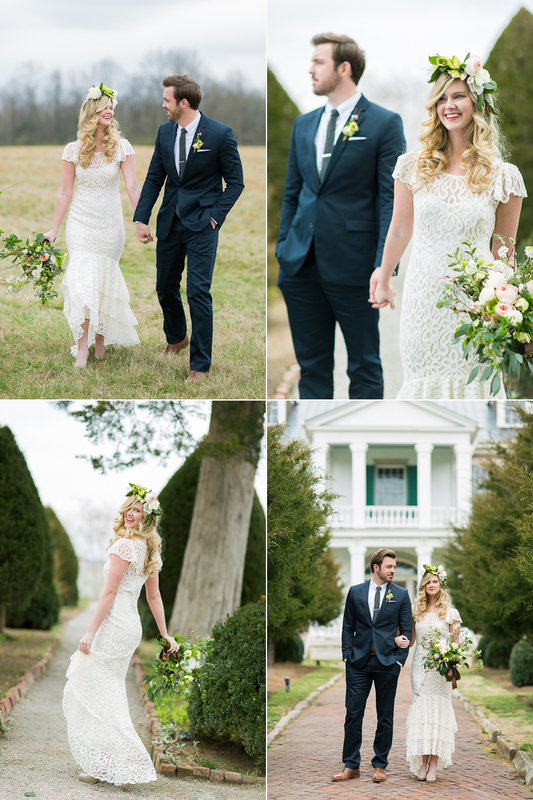 Inspired by the Southern charm and sophistication of great Southern names like Garden & Gun and Billy Reid, this shoot boasts beautiful spring florals, intimate settings and manicured gardens with real-life couple Meredith + Cody. The twist? The love story came to life! Read on for the romantic details. This fresh Spring day started at Lilly Belle’s in the upstairs bed and breakfast. The light was bright and soft. 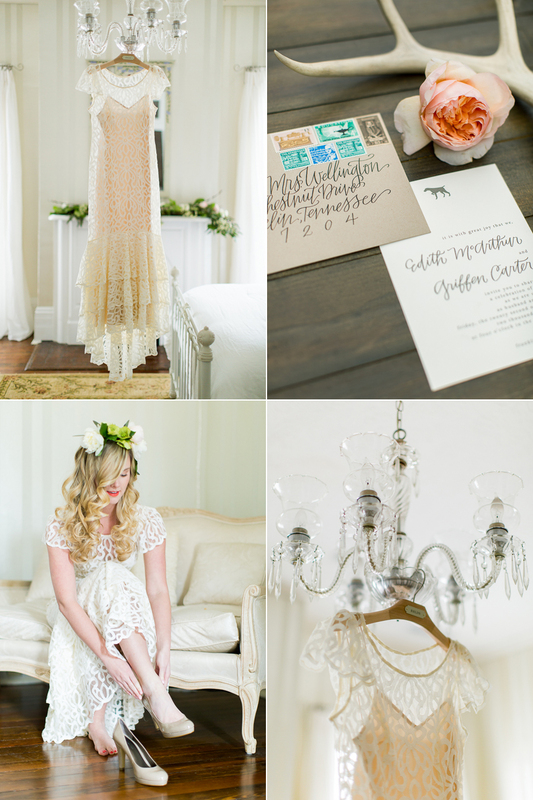 Meredith, our bride, wore a stunning laced BHLDN dress and her golden hair was crowned with fresh flowers. Cody, our groom, is pictured in his navy suit with a German Shorthaired Pointer. We then proceed to Carnton Plantation and featured the historic estate and gardens. 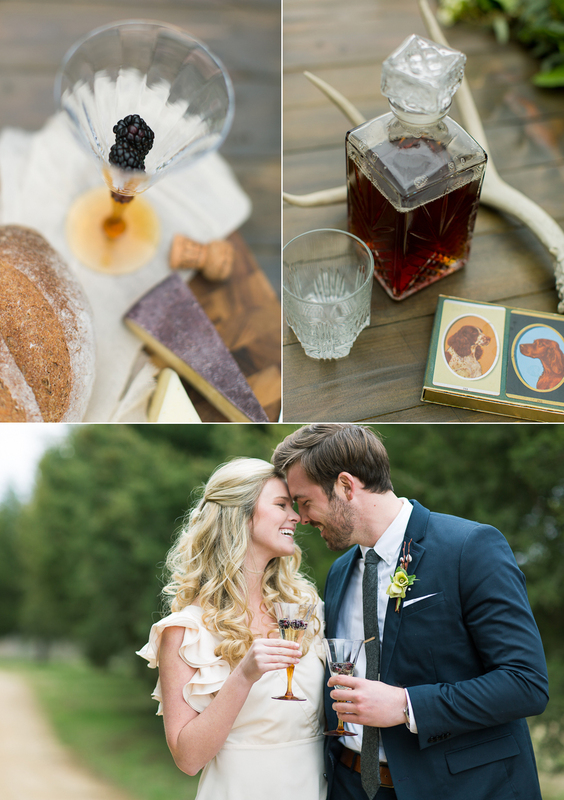 The intimate reception table is set between a row of trees, features a mixture of brown and white china, homemade pecan pies, wooden dog placards, beautiful earthy flowers, vintage playing cards, whiskey decanters, deer antlers and champagne with blackberries. Meredith graciously shared how she and Cody met! “Cody and I met our freshman year in college. We had the same math teacher, but our classes were back to back. Naturally, we would pass each other every day and catch the other’s eye from time to time. Cody and I go in your “opposites attract” category. I came from a small school in Nashville, was a perfectionist, and I was social but an introvert at heart. Cody, on the other hand, was always the life of the party, smart without every trying, never forgot a name, and was incredibly charming. I went to Knoxville devastatingly homesick for Nashville, catching rides home every weekend. Finally, a few weeks into the semester, I had to face my biggest fear: staying the weekend on campus. Somehow I ended up hanging out with Cody, and it changed everything. For the first time, I got to see Cody in his element: his city, his family, and abundant excitement for life. After that I never could quite shake him. There was something about being around him that brought the light-hearted and ridiculous side out of me in the best way possible. I learned that grades didn’t have to come at the expense of my college memories, and I learned that getting an A+ is not always worth the adventures missed out on." "I can tell you right now that I’ve always known I was going to marry Meredith. One of the first things I told her was, “You remind me of my mom.” (Romantic, right?) It sounds weird, but I am a huge momma’s boy. Meredith may not have known it at the time, but that was the best compliment she could have received. Anyway, fast forward a few years down the road. We graduated from UT, I started working, Meredith went to Vanderbilt, and we entered in to dating long distance. It wasn’t easy, and we knew that if we could survive a long distance relationship, we were in it for the long haul. Mere said, “I don’t think I want to be engaged during school.” Naturally, I proposed the day after she graduated. We were at a wedding in December when Rachel unknowingly kicked my plan to propose in high gear. 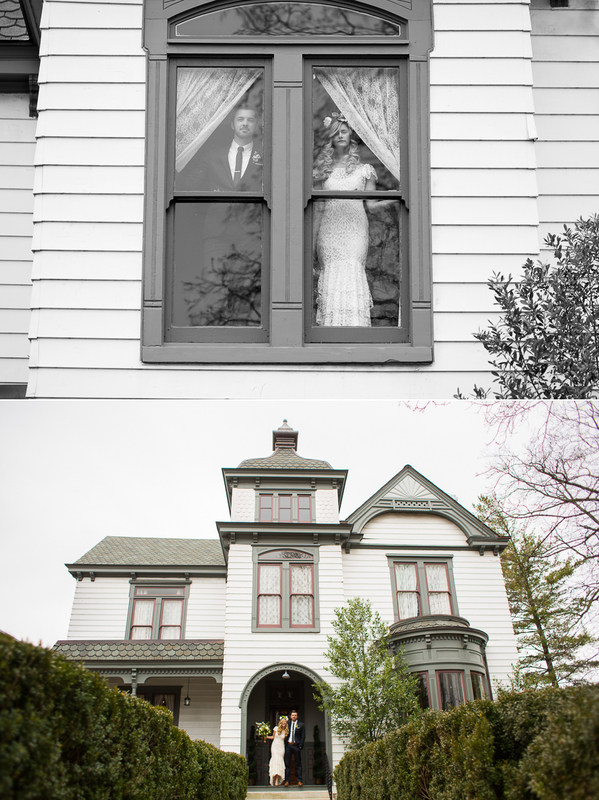 She asked Meredith’s friend, Tori (the bride) who we were and if we would be models for a styled shoot. Sure, we weren’t married yet, but I am a photographer myself and we jumped at the opportunity! As details for the shoot started unfolding, I picked up the phone and called Rachel. She LOVED the idea of a proposal during the shoot. I talked to Mere’s parents, got the ring, and coordinated with Rachel (all under Meredith’s nose). Finally, the big day was finally here. I couldn’t sleep for three days before, but I wasn’t nervous. The best way I can describe it is that feeling you get before Christmas when you know you’re getting an awesome bike. You can’t sleep because you’re so excited — and I wasn’t getting a bike, I was getting a wife! I hid the ring all day and we had so much fun at the shoot. There were numerous “marriage” comments but Meredith still had no idea what was about to happen. At the end of the day, Mere had changed into her getaway dress, and Rachel set up the shot for us to be “leaving the reception” so I could pop the question. Now, the whole reason we waited til the end of the shoot was so if Meredith cried, her makeup wouldn’t be messed up and ruin the entire shoot. Before I could get all of my words out, the waterworks were in full effect. Mere still didn’t believe it was happening (as her face shows in the pictures) until I pulled out the ring. Then, she said yes! After that, Rachel had brought us a bottle of champagne and captured the whole thing on photo and video. In the end, I’d say it worked out perfectly."